Learn how to make a beautiful, scrappy pieced border, and then add a float border to make it fit any quilt you make! Expert Gyleen Fitzgerald shows you how, step by step. To see a complete materials list for all class projects, download this Material List PDF. Most quilt patterns include a border sized to fit that particular quilt. Have you ever wished you could adapt a special border pattern to any quilt? Now you can! The clear, high-definition video shows you how to create the scrappy pieced border with squares and setting triangles. Then, Gyleen explains how to calculate a float border that magically makes the pieced border fit any size quilt! With her easy-to-follow worksheet included in the class pattern, you can calculate the float border measurements to apply the pieced border included in this class to any quilt! Combine solid and print scraps to make a colorful border. Learn how to size a pieced border to any quilt. Sew a stunning pieced border made with squares and setting triangles. 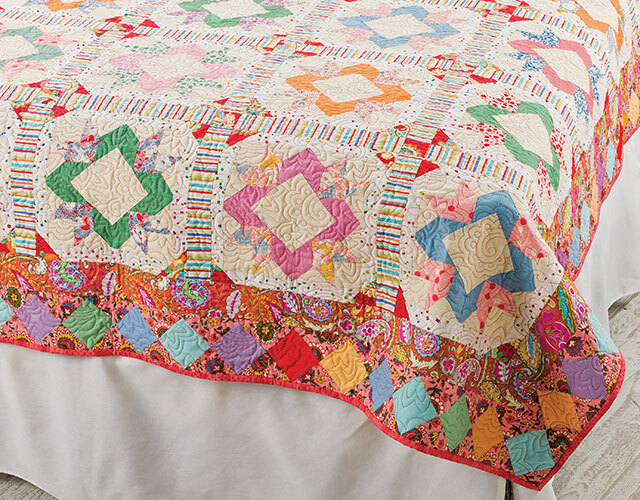 Calculate a float border that comes between the body of your quilt and the pieced border. Learn how to press bulky seams so they "spin" and lie flat. Class includes complete instructions to make the beautiful Arrowhead Star Quilt With Pieced Border. Learn to Quilt With Scraps: Stash to Treasure streaming online class and DVD include full video and written instructions to make the A Perfectly Pieced Border Sized for Any Quilt. If you purchase A Perfectly Pieced Border Sized for Any Quilt single-project online workshop and later purchase Learn to Quilt With Scraps: Stash to Treasure, you can receive credit for the single-project workshop by emailing Customer_Service@AnniesCraftStore.com or call us toll free at (800) 282-6643. I am novice quilter and was having a problem figuring out how to measure for the border to fit. I used her formula and it all worked out except for one measurement, I came up with a negative number on the formula for E. My measurements were 79 - 75 1/2 - 8 1/2 + 1/1/2.. I ended up drawing my own diagram and came up with a measurement for this float of 2 1/4. The other float came out at 8 1/4. These are my measurements: A=75 1/2, B=91, C=75 1/2, D= 79 and H=8 1/2. I am going to go ahead with the float measurements I came up with and think it will be fine. Thank you for the video, just not sure why it didn't work for me. Very enjoyable. Finally learned how to do the math for a border. I always just measured once down the side or across the fabric and then cut the border. I appreciate that you said to just follow the formula, not think. haha.. Great class. Thanks! Excellent class! I was struggling on figuring out the math for a rectangular quilt and I enjoyed Gyleen's explanation. Especially the "take your brain out of your head" and follow her instructions. When you are done you put your brain back. I laughed so hard because that is exactly what I did. Just followed her ABC instructions and got it right. Thanks for a great class. Love this class. Gyleen is a great teacher. She makes the math simple. Great class giving clear instructions for adding pieced borders to quilts.